Robert M. Levy, M.D., Ph.D. Robert D. Foreman, Ph.D.
Neuromodulation: Technology at the Neural Interface is a peer-reviewed publication that was launched in 1998 as the journal of the International Neuromodulation Society (INS) and its regional chapters. Wiley is the publisher. Neuromodulation is published eight times a year and is indexed in MEDLINE, PubMed and Index Medicus. Neuromodulation: Technology at the Neural Interface is the preeminent journal in the area of neuromodulation, providing our readership with the state of the art clinical, translational and basic science research in our field and representing the needs of the broad neuromodulation community. For clinicians, engineers, scientists and members of the biotechnology industry alike, Neuromodulation provides timely and rigorously peer reviewed articles on the technology, science and clinical application of devices that interface with the nervous system to treat disease and improve function. Neuromodulation covers an ever expanding field including pain, headache, movement disorders, spasticity, paralysis, psychiatric disorders, epilepsy, sensory deprivation, gastric dysfunction, obesity and incontinence. The journal represents the practice of a growing, diverse multidisciplinary field responsible for the development and application of devices and techniques to benefit patients by normalizing function and reducing suffering. In-depth reviews, original articles, national and international meeting abstracts, special focus editions and web based educational offerings help the reader to expand their knowledge and understanding of the interface between electrical stimulation, chemical neuromodulation, the nervous system and the patient. Neurotechnology reports keep the reader informed of the rapidly changing landscape of the business of neuromodulation while our updates on past and future news of events and activities of the INS and its membership keep the reader abreast of issues related to professional education and development. 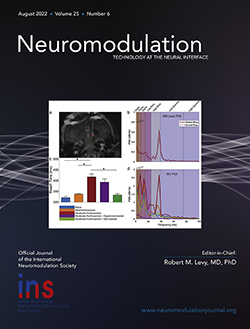 Neuromodulation: Technology at the Neural Interface has been reviewed by the National Library of Medicine and accepted for indexing in MEDLINE / Index Medicus / PubMed. All content, from the journal's first issue through the present, is now Medline listed. Find the most recent articles, once logged in, at the journal's landing page. If you are an INS member, log in to the INS website to access your online subscription. Non-members can access these articles by joining the INS or one of its regional chapters, or by purchasing access via Wiley's Online Library. Neuromodulation: Technology at the Neural Interface Early View articles are published on a regular basis online in advance of their appearance in a print issue. These articles are fully peer reviewed, edited, and complete – they only lack page numbers and volume/issue details – and are considered fully published from the date they first appear online. This online publication date is shown with the article. The articles are available as full text HTML and can be cited as references by using their Digital Object Identifier (DOI) numbers. For more information on DOIs, please see http://www.doi.org/faq.html. To view all the articles currently available online in Early View, please visit the journal homepage. Prior to print publication, the Early View online posting does not specify volume or issue number (which will appear online as "0" during this time between online and print publication). Upon print publication, the article volume and issue number will be shown and it will be listed in the relevant online issue, complete with page numbers and volume/issue details. No other changes will be made. The implementation of Early View for Neuromodulation represents our commitment to get manuscripts available to view to the academic community as quickly as possible, reducing time to publication considerably without sacrificing quality or completeness. In addition to receiving traditional paper subscriptions, International Neuromodulation Society (INS) members can access their free online subscriptions on Wiley's Online Library, simply by logging into the INS members-only section and clicking on the link to the online journal. Easy-to-use Interface: developed in consultation with users to deliver intuitive navigation and easy access to articles, chapters, references, and supplementary information. Easy-to-Find Relevant Content: discover more through reference linking, search filtering, related articles, and added value initiatives such as virtual issues, podcasts and dedicated subject pages. Easy to Keep Up-to-Date: content alerts and RSS feeds to keep you updated with the latest published research, including journal tables of contents, Early View and Accepted Articles articles, and search results. If you are having trouble accessing your online subscription, please email the Editorial Office and we will promptly assist you. Robert M. Levy, M.D., Ph.D.